This lunar month is perfect for enjoying some much needed Piscean pampering. I'm planning to get an esoteric healing treatment from healing Goddess, Terri at The Pearl - her spa/home is a fairyland filled with art, antiques and healing vibes! I suggest that some primo relaxation time is in order! Try luxuriating in a hot lavender bath or sleeping with a mugwort filled sachet or a moonstone under your pillow and don't forget to call upon a Piscean mermaid or two to water and bless your dreams. This Pisces Moon heightens our awareness, our senses, our compassion, and our imagination. How will you apply this peace of mind to the world at large? How can you orient yourself to follow and express your bliss in ways that benefit the planet? Get ready to identify your gifts and let your talents blossom forth as the Spring Equinox fast approaches and we are catapulted into the sign of Aries. I know I have! I just emailed my best friend to apologize for being 2 weeks late in remembering her birthday and I was actually a month early! So what's going on?! If you've been feeling disoriented this past month it could be due to the large number of planets that are currently in the airy and ungrounded sign of Aquarius and this feeling will most likely continue in the month ahead. Aquarius can teach us how to stretch our limits and explore radical ideas but remember, Winter still prevails and encourages us to stay put and contemplate the year that has passed. Try and stay grounded, tap your spirituality, explore new ideas, and let peace flow naturally into your life and your home as you prepare for the arrival of Spring on March 20th at 4:44 am PDT. For those of you interested in exploring where the New Moon falls in your astrological chart to better prepare yourself for the month ahead I have created a New Moon Reading. "My drawings have always been a whisper....or a silent scream....a tell~tale story of what lies beneath the obvious. 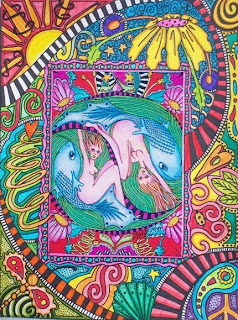 Hidden in the psychedelic colors of chaos I find peace. And in my swirly, twirly fairytale, I believe that under the cold crashing truth of reality the deep, deep water is warm and that in the trail of tornadoes and hurricanes accidental gifts are found and in this everyday thing we call life, if you're not laughing and dreaming you're only treading water. I'd rather be floating.... Much Peace, Sing." 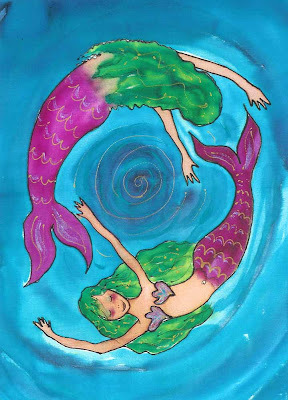 This month's Giveaway is titled "Circle of Mermaids" - an 11 x 14 matted print of my original silk painting featured at the beginning of this newsletter. To enter this drawing you will need to sign up as a fan of my Facebook Page and respond to my Discussion Board posting titled "What is bliss?" I can't wait to hear your inspirations! All my mermaid paintings were inspired by eight years of living in the gorgeous and unforgettable Laguna Beach, California where I befriended my very own red-headed mermaid, Tangerine! The money issue remains a touchy subject for folks right now, so take a little time to examine your own relationship with money. My question for you, dear readers, is this: "Has money become more important to you than love?"